Pandit Deendayal Upadhyaya was born on 25th September 1916 to Pt. Bhagwati Prasad Upadhyaya and Smt. Rampyari. 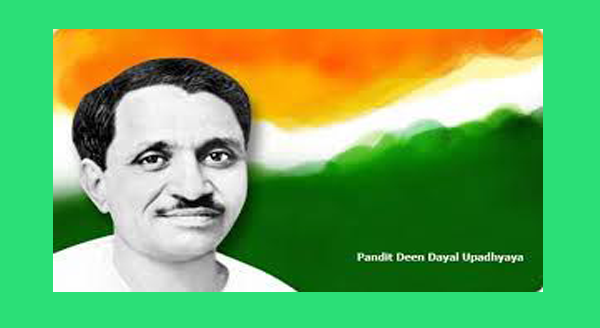 Deendayal or “Deena” as he was known in childhood was born at his maternal uncle’s home in Dhanakia in Rajasthan, while his father belonged to Nagla Chandrabhan in Mathura, the land sanctified by Sri Krishna. At Nagla Chandrabhan today stands a grand memorial dedicated to the life and contributions of Deendayal Upadhayaya, recounting the saga of his inspiring life. Two years later, Deendayalji’s younger brother Shivdayal was born. Bhagwati Prasad, Station Master at Jalesar Road Station, died suddenly when Deena was just two and a half years old. The family was given shelter by his maternal uncle. But the series of bereavements in Deena’s life did not end with this, his mother Rampyari died when Deena was just four years old and his brother Shivadayal, struck with pneumonia, died in 1934. Destiny however had something else, something greater in store for Deena. An exceptionally brilliant student, a keen observer with a razor sharp mind and analytical skills, Deendayalji topped examinations, received accolades and prizes and repeatedly earned scholarship through the dint of hard work. Having passed the intermediate examination from Rajasthan, Deendayalji completed his Bachelors from the Sanatana Dharma College in Kanpur and enrolled at the St. John’s College in Agra for his Masters. Despite being a brilliant student Deendayalji chose not to take up a government job and instead focused on further studies, joining a B.T. course in Prayag. It was at this crucial and formative period of his life that Deendayalji came in touch with the activities of the Rashtriya Swayamsevak Sangh (RSS). This meeting, this discovery and association altered the direction of his life and transformed it altogether. Henceforth he was determined to dedicate his life and all his energies to the upliftment of Bharatiya samaj and became a Pracharak of the Sangh dedicating his life to national regeneration. Very soon Deendayalji was given the responsibility of organising RSS work in Uttar Pradesh – then known as United Province – and became district Pracharak of Lakhimpur Kheri in 1942 and eventually rose up to become the Sah Prant Pracharak of entire UP in 1945. Deendayalji shouldered his responsibilities as General Secretary till 1967 and built the base of the new party, spread its ideals and organisation across the country and successfully articulated a new political vision for India. 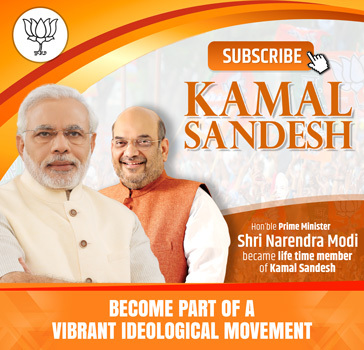 It was in the historic Calicut (Kozhikode) session of the Jana Sangh that Deendayalji became the national president of the party. But his grand and tireless march towards realising the dream of a great and regenerated India came to an abrupt and shocking end when he was found dead, under mysterious circumstances, on the night of 11th February 1968 near Mughalsarai railway station.